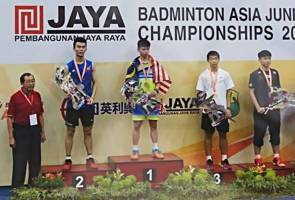 KUALA LUMPUR: Datuk Seri Najib Tun Razak has congratulated national junior shuttler Leong Jun Hao for winning the men's singles title at the Asian Junior Championships in Jakarta, Sunday. "Congratulations Leong Jun Hao on winning the badminton Asian Junior Championships!" the prime minister wrote on his Twitter page last night. Congratulations Leong Jun Hao on winning the badminton Asian Junior Championships! Jun Hao, 18, fought hard for one hour and 14 minutes to claim a 21-6, 20-22, 21-17 win over China's Bai Yupeng at Jaya Raya Sports Hall Traning Centre, said the Badminton World Federation's (BWF) official results page bwf.tournamentsoftware.com. Jun Hao ended Malaysia's four-year wait for the title which was last won by Soo Teck Zhi at the 2013 edition in Kota Kinabalu, Sabah in the under-19 age group tournament. Sixth seed Jun Hao advanced to the final after beating Thailand's Kunvalut Vitidsam, 19-21, 21-14, 23-21 in the semi-final match yesterday.